Archaeologists were surprised to discover the mummy of predators with sinister faces, saber-toothed, saggy skin and a tail like a whip. 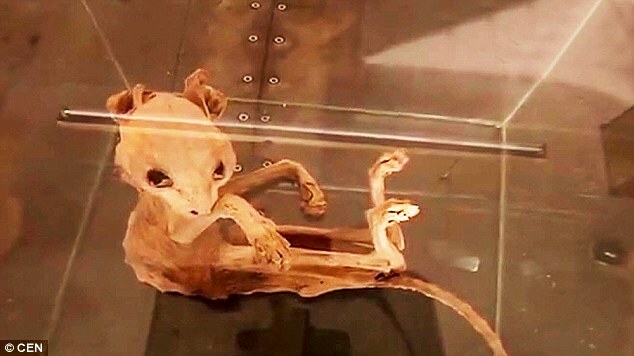 This mysterious animal found in Turkey and making the experts confusion. This strange predators found in an old basement and still to be identified by experts in the natural history of this country. 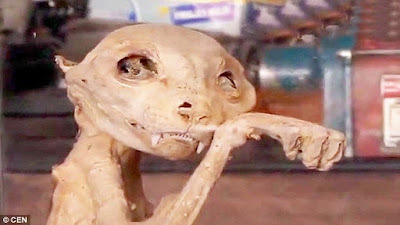 The archaeologists have theorized these animals may from prehistoric times, while others believe it could be a kind cat, based on his front teeth. Dr. Lidija McKnight, an expert on ancient Egyptian and animal mummies at Manchester University told DailyMail on Monday, Feruary 2, 2016 said, "It looks like one of the naturally mummified cat we found in the UK, in the walls of the chimney, for example." "The tarsel bone/carpel that looks long and had been diagnosed as cat species," she added. This strange mummy said to have a length of 1 meter from the nose to the tip of its tail. Dr. McKnight said further, "One meter long, but if it is a wild cat species, for example, they can be much larger than a domestic cat."